"The copy I read at Bedford V.A. was very informative, I am sure I will get a lot of my questions answered." "I think it is an informative and interesting publication and is needed to inform veterans about benefits and services." "I love this magazine, very good and informative." "Thank the lord, it's about time." "I think your magazine has a lot of great information in it and it is about time somebody thinks of the Veterans, Thank you alot." "I think this publication is very informative, lets the Veteran be informed about current issues that can help us very much. I'm glad this magazine is available to us." "I found this publication to be very informative and a lot of the things that I was curous about was answered." "First, the cover caught my eye, not being familiar with it, then I was consumed with the very informative contents for quite sometime. I immediately subscribed. Thank you." "I love the information that you provide in your publication." "Outstanding! The best I've seen yet. Everything is finally under "One" roof! The Veteran no longer has to subscribe to many Veteran magazines. Short and to the point, it is a pleasure to read. Thank you!" "Valuable info that every Veteran should know. Easy to read and understand. Good reading for every Vet. A job well done. Thanks." "I think that it is long past due! Thanks!" "A fine magazine, glad see some veteran's acknowledgments! Keep it going!" "I think the publication is absolutely wonderful. Thank you so much for this magazine"
"While I was in the VA Hospital in Fayetteville, AR, I found one of your magazines and couldn't put it down until I had completely finished reading it cover to cover. The magazine is great, I really appreciate it!" The world average paper consumption per person is an estimated 123 pounds of paper each year. Approximately 28% of this average paper consumption is used in printing documents. In the future paper consumption is still estimated to grow more than 2% annually. Considering the U.S. paper industry emitted around 17.2 million metric tons of carbon dioxide to product 83 million tons, we can infer that the would paper industry emits over 74 million metric tons of carbon dioxide each year. A Green PDF is a PDF that is circulated electronically and not printed. It takes only 173 reams of paper not printed of Green PDF's to save a tree and lessen atmospheric carbon dioxide levels by more than 2 metric tons. Through the process of photosynthesis, trees remove 100 to 120 billion tons of carbon each year. Each tree used in making paper removes about one metric ton of carbon dioxide from the atmosphere every year. When a tree is cut down, the Earth loses a "carbon sink." Each tree on average produces 173 reams of paper. Therefore, each ream of paper is then equal to roughly 12 pounds of carbon dioxide not removed from the atmosphere. An easier way to cut down the use of paper is to emphasize on the use of soft copies of the information and data rather than the hard (printed) form. With almost each and every sector of the world being computerized and connected rough the Internet, all forms of organizations should give stress on using the soft data thereby avoiding the use of printed matter. We are going to begin to support the Green initiative. We will be helping to reduce greenhouse gas emissions by cutting back world wild office paper consumption. Through your support and efforts we can help save countless trees each year. It takes only a second to waste a beautiful sheet of paper but decades for a tree to grown. 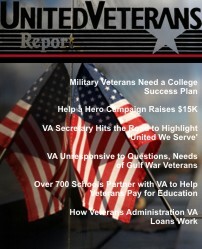 The United Veterans Report is proud to be Green.